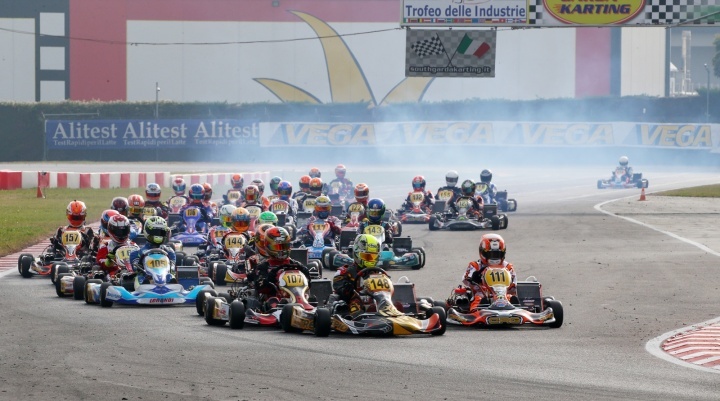 Several drivers among the 248 on track at South Garda Karting have what it takes to fight for the victory of the 46th Trofeo delle Industrie. An intense racing day has just ended at the South Garda Karting circuit in Lonato that has housed qualifying for the 46th Trofeo delle Industrie, the very important end-of-season karting event organized by Parma Motorsport that in this occasion had a record presence of 248 drivers in categories KZ2, OK, OK-Junior, 60 Mini and Iame X30 Senior. Several protagonists have been shining in the different grades on track today for qualifying. Some surprises were also among them. The quickest of KZ2 was the World and European multiple-champion Davide Forè (Gold-TM-Vega), who was the quickest of Group 2 in 45.844s, but the absolute quickest was Giacomo Pollini (Formula K-TM-Vega) who posted a 45.592s in Group 3, while the quickest time of Group 1 was set by Fabian Federer (CRG-TM-Vega) in 45.621s. Last year’s winner Riccardo Longhi (BirelArt-TM-Vega), the very quick GP3’s driver Alessio Lorandi (Tony Kart-Vortex-Vega), Giuseppe Palomba (Intrepid-TM-Vega) and Mirko Torsellini (Zanardi-Parilla-Vega) have also run a strong qualifying session. Federer took two wins in the heats, as Longhi, while Pollini and Palomba claimed one each, making it a good lot of contenders to the final victory. The OK pole position was obtained by Mattia Michelotto (Zanardi-Parilla-Vega), while the first heat was won by Lorenzo Ferrari (Exprit-Vortex-Vega), who led the Brit Christopher Lulham (Exprit-TM-Vega), while Michelotto was third proceeding Andrea Rosso (CRG-Parilla-Vega) and the Russian Alexey Nesov (Tony Kart-TM-Vega). The second heat will take place on Sunday morning. Vittorio Maria Russo (Tony Kart-Iame-Komet) had the upper hand in qualifying of X30 as well as in the first heat. In the latter case, he topped Alessandro Salvarani (BirelArt-Iame-Komet) and the Argentine Luca Longhi (Tony Kart-Iame-Komet). This category will also run a second heat tomorrow morning. The two quickest times in OK-Junior’s qualifying went to the reigning World Champion Dexter Patterson (Exprit-TM-Vega) in 47.615s (Group 1) and to the Swede Dino Beganovic (Tony Kart-Vortex-Vega) in 47.639s in (Group 2). Patterson won also both heats, while Beganov claimed a win and a sixth place. The absolute quickest time of 60 Mini was posted in Group 3 by the Swede William Siverholm (IPK-TM-Vega) in 53.304s, while Alfio Spina (CRG-TM-Vega) went quickest in Group 1 in 53.373s and the Austrian Kiano Blum (CRG-Tm-Vega) posted the fastest time in Group 2 in 53.448s. Nikita Bedrin (Tony Kart-TM-Vega) won three heats, while two wins went to Siverholm and one to Spina.